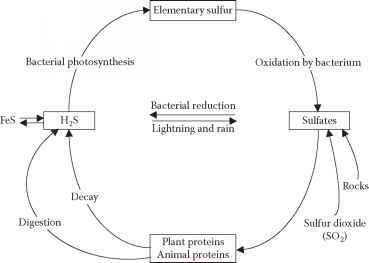 We present here the N cycle in both livestock and crop production systems, because their interrelations are crucial for N input and N2O emissions from agricultural land. Livestock production takes place in two production systems: (1) pastoral systems and (2) mixed and landless systems (Seré and Steinfeld, 1996; Bouwman et al, 2005). Mixed systems comprise both crop and livestock production, linked by animal feed and fodder, manure, etc. Landless ruminant production systems are included in mixed and landless systems, because they have the same interrelationships between crop and livestock production. Extensive grazing by ruminants is dominant in the vast areas of grassland in pastoral systems, where crop production is only a minor activity. Pork, poultry and eggs are only produced in mixed and landless systems. However, ruminant meat and milk can be produced in pastoral as well as in mixed and landless systems. For the inventory, we used data on total fertilizer-N consumption per country for the year 2000 from FAO (2008), and data on N fertilizer use by crop from IFA/IFDC/FAO (2003). Data for animal stocks for ten animal categories (beef cattle, dairy cattle, buffalo, pigs, poultry, sheep and goats, along with the category of small ruminants, donkeys, mules, horses and camels) for the year 2000 were obtained from FAO (2008). Associated N excretion rates, specified for Western Europe, North America, the remaining industrialized countries and developing countries, were taken from van der Hoek (1998). Animal manure is distributed over different management systems, including grazing, animal houses and storage, and other uses (mainly fuel); stored manure is used for spreading on cropland and grassland (Figure 5.4). Details on the approach to distributing the fertilizer and manure N are provided by Bouwman et al (2006b) and Beusen et al (2008). Direct N2O emission from fertilizer-N application and spreading of animal manure is calculated according to the residual empirical maximum likelihood (REML) model of Bouwman et al (2002b). Ammonia volatilization rates for animal barns and grazing systems are taken from Bouwman et al (1997), and volatilization from spreading of animal manure and N fertilizers is calculated using the REML model of Bouwman et al (2002a). For indirect emissions we use the EFs of IPCC (2006). Indirect emissions include emissions associated with NO3~ leaching calculated according to Van Drecht et al (2003), and emissions associated with NH3 emissions from croplands, from applied fertilizer-N and manure-N. Approximately 65 per cent of 112.4Tg yr_1 N in manure is generated from mixed and landless systems, whereas 26 per cent comes from pastoral systems (Table 5.2). The remaining 10 per cent ends outside the agricultural system (fuel, building material, etc.). Within the mixed and landless systems, 65 per cent of the manure is collected in animal barns and storage systems, and 35 per cent is excreted in pastures. A large amount of manure-N (33.3Tg yr_1) is collected in animal barns and storage systems in mixed and landless systems and applied mainly to croplands, with a smaller amount to pastoral systems (Table 5.2). /Vote: This approach allows for assessing the impact of measures in one part of the N cascade on the next. 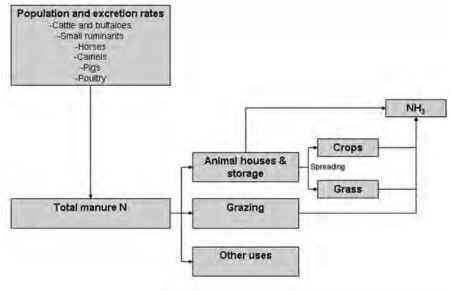 For example, lower N excretion rates by improved feeding have an impact on the amount of manure-N in arable fields. Likewise, reducing NH3 emission from animal houses and storage systems causes an increase in the availability of manure-N.
Total direct and indirect N2O emissions from the annual 79.1Tg yr-1 of N fertilizer use and 33.3Tg yr-1 of manure-N spreading in global arable systems amount to 4Tg N2O-N yr-1 for the standard inventory (Figure 5.5; Table 5.3). Using this model we calculated the effect of various mitigation options for reducing N2O emissions discussed in the next section.